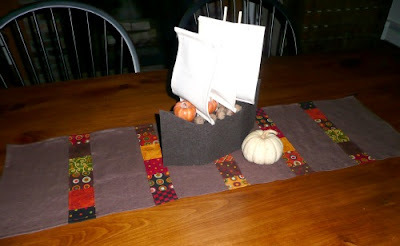 As I put away my Halloween decorations last week, I realized that I was going to need to make a new table runner since I had to pack up my Halloween table runner that I made this year. 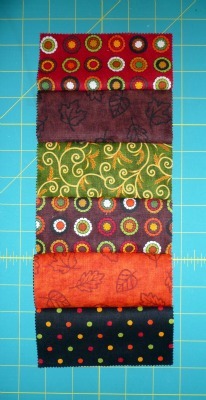 I had grand plans to make something quilted and possibly reversible. Well, that plan quickly went out the window when I looked at the calendar. I don't have time for that with all the Christmas gifts I need to make and Christmas ideas I have swirling in my head. 1. 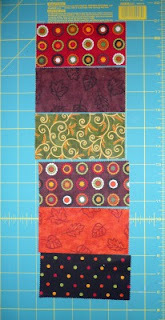 Cut 5" x 5" charm pack squares in half. You will need six pieces of fabric for each patchwork column on your runner. If you aren't using a charm pack, cut strips of fabric 5" x 2.5". 2. Placing right sides of fabric together and using a 1/4" seam allowance, sew strips together to form a column. 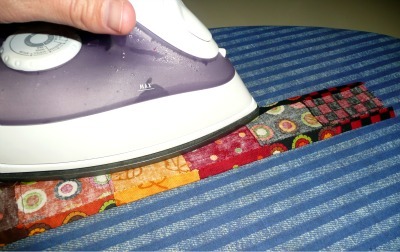 Press your fabric. 3. Cut the column in half lengthwise to create two patchwork column strips for your runner. 4. Repeat steps 1 through 3 to create however many strips you want to sew onto the linen. 5. Fold the long edges in 1/4" and press. 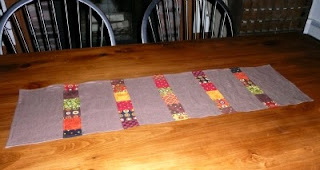 Do this on both long edges of every patchwork strip you just made. 6. Cut a piece of linen 13" x 38". 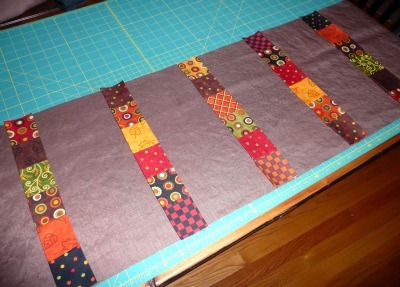 Lay your patchwork strips out on top of your linen. You can measure if you want them perfectly spaced. ﻿7. 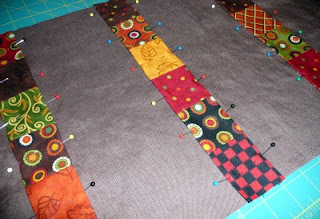 Pin your patchwork strips to your linen. 8. Topstitch your patchwork strips to your linen about 1/8" from the edges of your strips. 9. Hem the edges of your linen, and you're done! Quick and easy project! Love the way it looks on the table, especially with my new Mayflower centerpiece sitting on it. I think I'm about done with Thanksgiving projects. I have one more little thing that I'm working on, but then it's time to get on my Christmas list. I hate starting so early... I always feel like I'm neglecting poor old Thanksgiving. I hope she understands. I love the look of the linen! This is darling! Love the fabrics and how simple to just sew the strips on top of the linen. You know how sometimes you just have that duh! moment- I never would have thought of that. Great job Gwen! Oh how cute and how easy! I love that you saved time by putting the charm strips on top. And it looks great with your mayflower! I like it...a LOT! I especially like the fact that the strips of patchwork aren't right next to eachother...I can never get mine to line up just right. 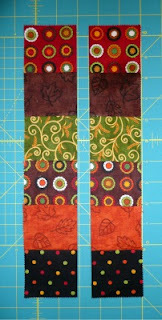 This might be a good project for me and my inability to pull of patchwork. Cute runner! I need to whip up a couple of easy holiday gifts, if I can find the time, so I'll definitely be back for this tute. P.S. 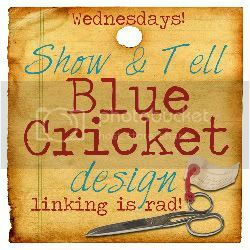 - I'm loving your blog header today, so bright! Stunning! I love the way you do runners for all your festive seasons. My poor old table is very underdressed. I'll have to take a leaf (or an acorn!) out of your book. Beautiful! 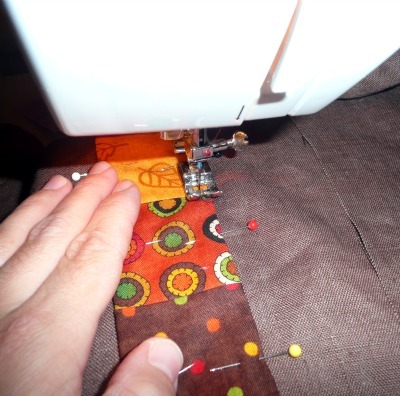 Have I mentioned that I am jealous of your sewing ability???? You are always full of ideas! Love this runner, too! My to-do is getting too long! LOL Now can you come over and teach me how to sew? Very pretty and I like how it's all straight stitches, which makes me believe even I could make one! super cute! a great way to use up a charm pack too! I just had a flash for Christmas. One could make a strip of snowballs on green or red and have a snowball snowman patterned runer.